Love them or hate them, spreadsheets play an undeniable role in the operations of many businesses. They offer users a convenient way to manipulate data and a scratchpad for programming with small amounts of data. Given the importance of spreadsheets, incorporating them in your data warehouse — while still maintaining the ability to change the spreadsheet — can enable new collaborations and quicker insights. Fortunately, Google BigQuery can query Google Sheets just like any other table, allowing exactly this kind of collaboration. Here’s how you can query your Sheets using BigQuery, plus tips on how to easily maintain sharing controls to keep your data protected. In the BigQuery Web UI, click on a dataset and choose to create a table. Choose the source as Google Drive. 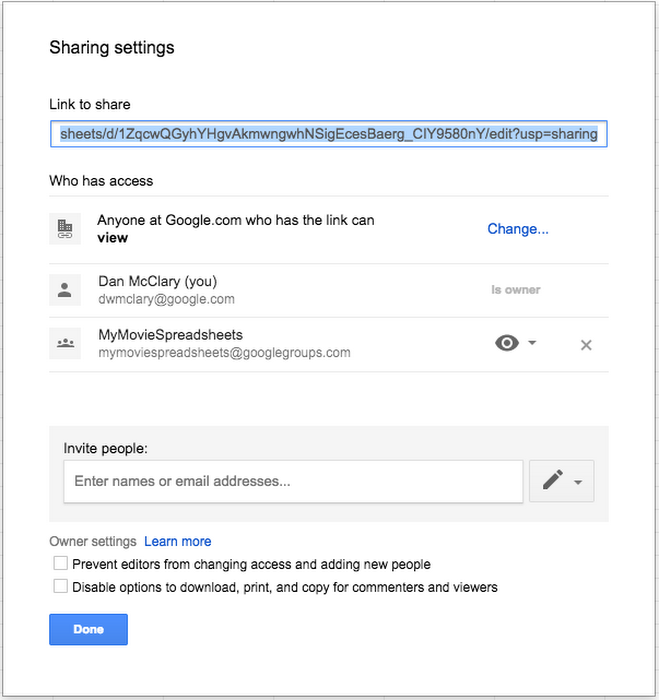 Paste the URL for your Sheet into the location bar. Note: Make sure you copy the URL from the worksheet in Sheets that you want to serve as the table. Choose either CSV or Sheets as the format. Note: CSV format will allow you to check “Auto-detect Schema.” Sheets’ format will allow you to specify the column names and types. Or what if we want to take visiting friends and family on a movie-themed tour of San Francisco? We can use Array SQL to create a concise crib sheet for each of the locations we’d visit. Unlike most tables in a data warehouse, we expect spreadsheets to change often, and not through SQL statements. Fortunately, BigQuery takes this into account when you create tables backed by Sheets. You can edit a sheet and relevant changes appear immediately in BigQuery. For example, we can add Ant-Man to our sheet and it automatically populates in the query. The new data is picked up where relevant, and adding a column doesn’t break the existing query. 1. Give MyMovieSpreadsheets view access to the Sheet. 2. Share the BigQuery dataset with MyMovieSpreadsheets. 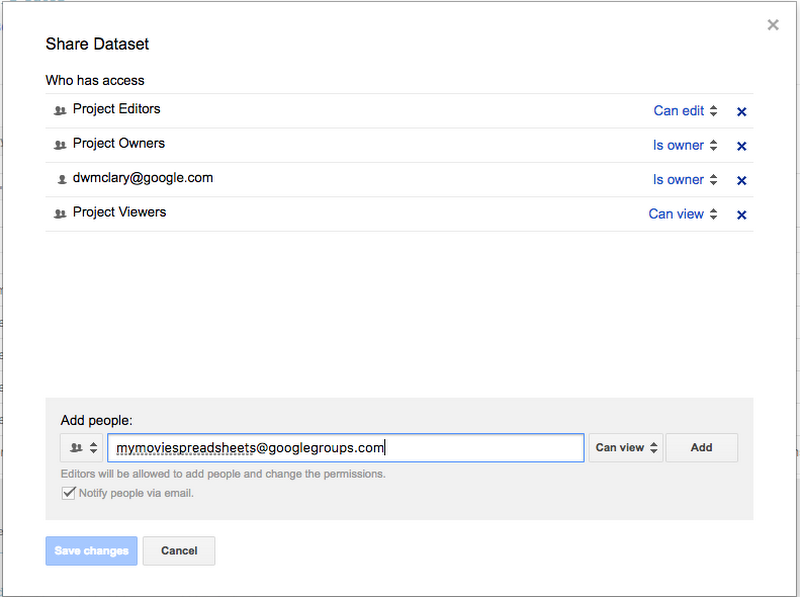 Now, you have a convenient way to manage access to both the spreadsheet and the dataset. If you want to try these queries yourself, just join this public Google Group. It's important for you to be able to work with tools you're comfortable with in the workplace, and to gain valuable data insights for your team all in one spot. Test out BigQuery and Sheets queries at https://bigquery.cloud.google.com and try these examples.